This is the last part of the 3-part series (part 1, part 2). She doesn’t approve of his manners. When I was a teenager, thinking doing something appalling would stop the misery of humankind, I did manage to pour miso soup over my rice a couple of times. My parents never liked it. They frowned and raised their voice. My wife tells me the similar story. It’s been one of those manners at the table for a long time. 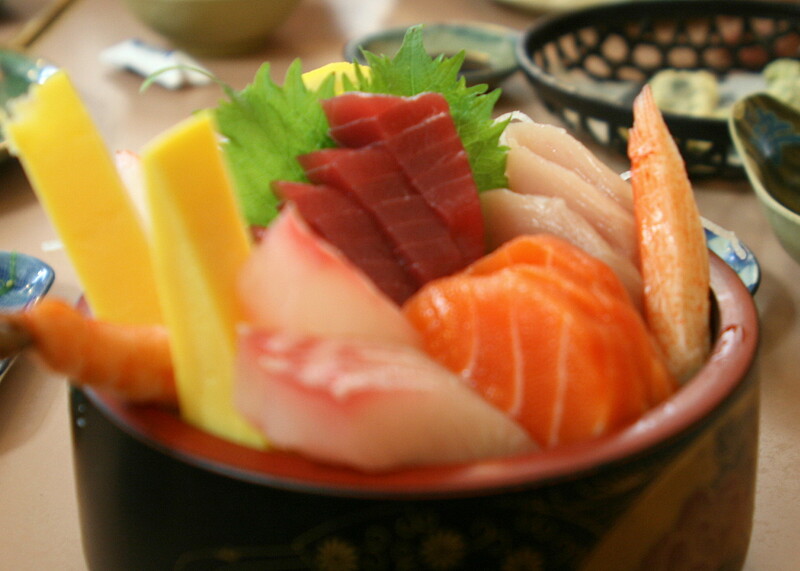 Even today, it is considered uncivilized for an educated person to slurp miso-soup over rice in front of others. Then this ochazuke, green tea over rice. It’s a little bit different. This is widely-appreciated menu/practice and you might find it quite often. I assume there are very few people who considered it inappropriate or bad manners today. But ochazuke was for commoners. As the anecdote of Takashi Shimura suggests, some families of noble origins, – samurai, traditional artists, royalties, etc. – might have considered it low-class. “The Flavor of Green Tea Over Rice” pictures the orthodox, pre-modern social class structure and its collapse. Various plot devices appear to subtly emphasize the slight cultural dislocation among characters. Various food, pachinko and even the subtle layout of the Satake’s house tell the uneasiness of social blending taking place. Mokichi is not a person of noble origin, but he is well-educated, mild-mannered and quiet. Taeko, who comes from the upper class, sees him little short of sophistication. How Mokichi eats his meal – miso soup over rice, while reading newspaper – is “eating like a dog” to her (well, to most of us, really). This conversation creates the layout for the last scene of late night meal. 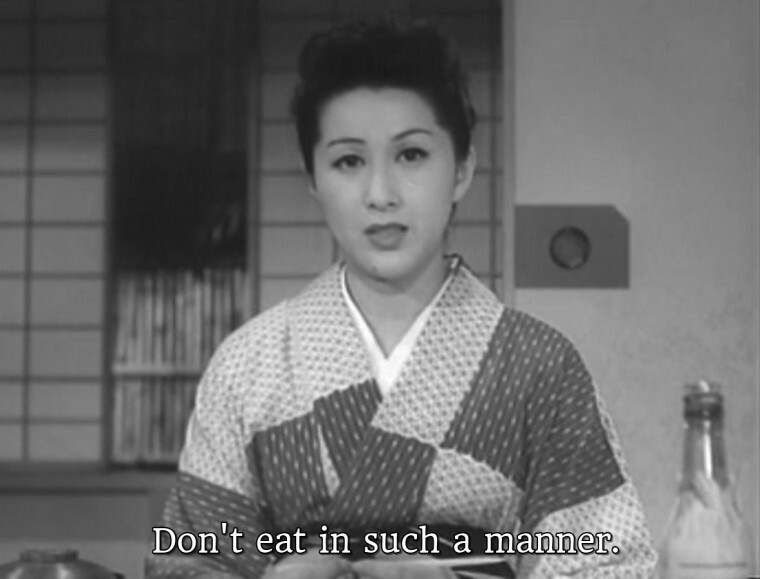 That’s when Taeko takes out cucumber pickles out of the nuka paste pot. She used to be a person who spends her time manicuring, and you don’t put manicured nails into a nuka paste pot. Somebody else – a maid – will do that. And here, Taeko has Mokicihi smell her hands – the smell of nuka. 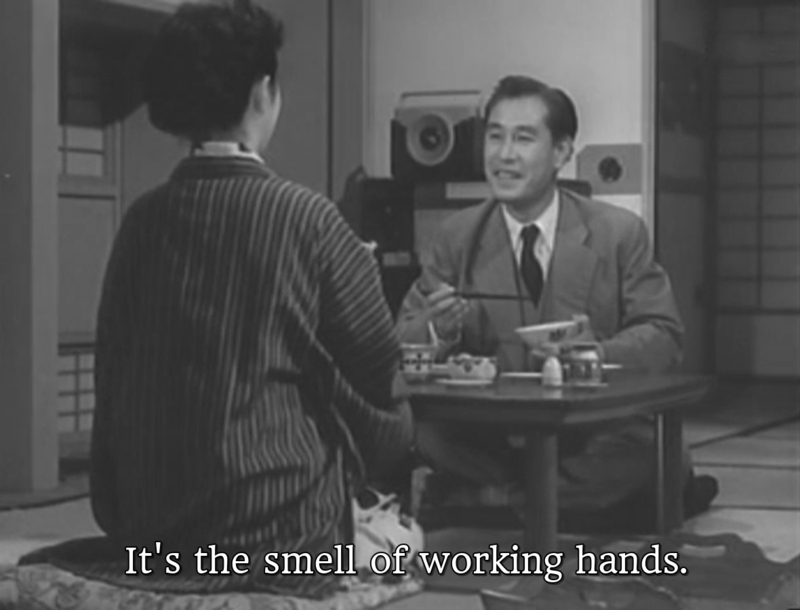 In the English subtitles I checked, Mokichi’s line is “It’s the smell of working hands”. Actually, literal translation would be “Your hands must be surprised”. I guess the original Japanese wording conveys the sense of change. In many cases, the appearance of ‘nuka’ symbolizes the change in social class (usually downward). 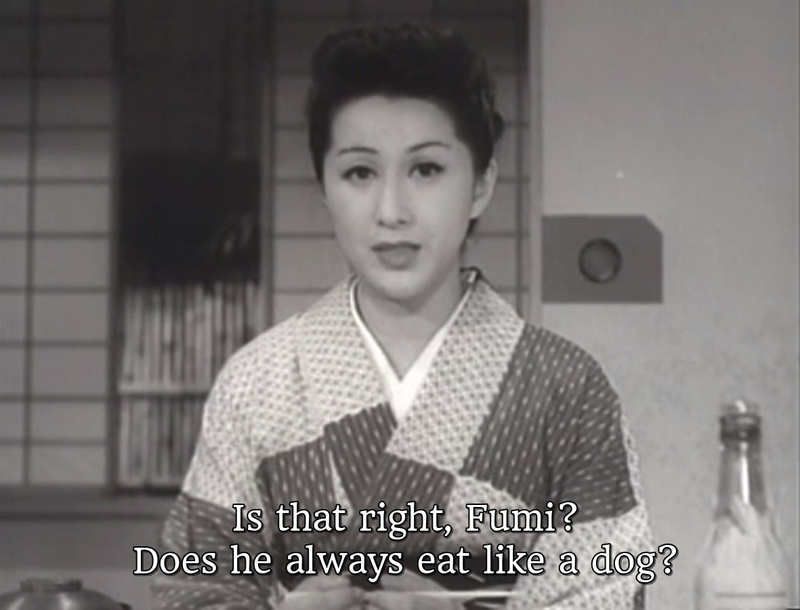 In Noboru Nakamura’s “Tabiji (旅路, 1953)”, the middle-aged aristocrat who lost the royal status urges his wife to be more ‘common’ and ‘down-to-earth’, making comments about a life that cherishes the taste of nuka pickles. This kind of metaphoric status of nuka is counter-parallel to polished rice. The story about polished rice causing beriberi, Vitamin-B1 deficiency, among the Army soldiers is revealing in this point. One of the reasons Mori and the other officials were reluctant to change the diet to wheat was the status of polished rice at the time. They assumed that most of the soldiers, being young siblings from poor farmers, would rather appreciate polished rice meal (expensive luxury for them) than wheat-loaded rice which they must had been accustomed to. Arrogance on the part of your ally is even more offensive to you than the arrogance of the part of your enemy, of course.